Austin, TX, October 11, 2017— The University of St. Augustine for Health Sciences (USAHS) announced that physical and occupational therapy students will volunteer at the next Sunshine Soccer Clinic, coinciding with the Global Physical Therapy Day of Service. 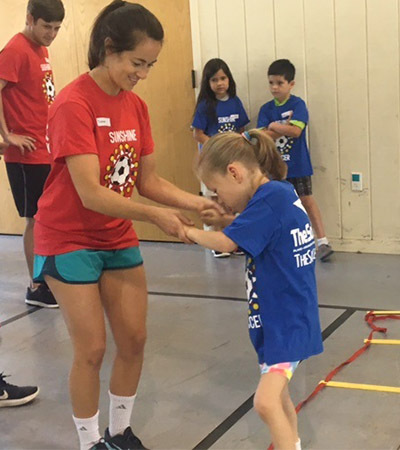 This collaboration between the university and the Sunshine Soccer Clinic is led by USAHS Doctor of Physical Therapy faculty member, Megan Flores, PT, MPT, PCS. The Sunshine Soccer Clinic pairs children with special needs with physical and occupational therapy students in order to provide an opportunity for youth to interact with peers in a team sport, to be active using their unique abilities, and to move and explore their environment in a safe way. The events also provide parents with an opportunity to connect with other families facing similar challenges. Sunshine Soccer was founded by professional soccer player Sonny Guadarrama and physical therapist, Melissa Meyer. Guadarrama, an Austin native, recently retired from playing professional soccer in Mexico for 11 years. The clinics are held on the second Saturday of every month, from 7:45 a.m. to 9:00 a.m. at Manchaca Baptist Church, in Manchaca, TX. The next event is Saturday, October 14, at 7:45 – 9:00 a.m. Additional information can be found at the Sunshine Soccer Clinic Facebook page. For more information about USAHS, visit usa.edu.